Hopefully you are better prepared for the holiday season than I am…but if you are like me, who tend to wait until the last minute, we are in luck! I love online shopping for that reason and right now many online stores offer free 2 day shipping! Plus, there’s always the gift card option! Here are my top 5 gifts that I wouldn’t mind getting in my stocking and I’m sure neither would your friend. 1. GoPro camera…I mean, who doesn’t want to record their travel, adventure and more? The things you can do now with a GoPro are pretty astounding. And prices have come down too. REI has a special right now going on where you get a $50 REI bonus card if you buy a GoPro. Buy it as a gift, keep the $50 REI bonus card for you. Win-win! GoPro camera not in your budget? REI right now has FREE shipping with no minimum purchase. Order by Dec 23rd to have it delivered by Dec 25th! 2. The Osprey Packs Flightlocker Organizer is guaranteed to become a hit as a gift. Great way to organize your belongings in a small pack. Osprey is one of the leading travel bag companies and for a good reason! Their stuff is amazing, great quality and practical. Plus, you can never go wrong shopping from Backcountry.com that carry a lot of their packs. It’s one of my favorite online stores. Always great deals and fast shipping. 3. Let’s not forget about our four legged canine friends. They want something in their stocking too! The Quick Draw Dog Leash from Ruff Wear is super cool. 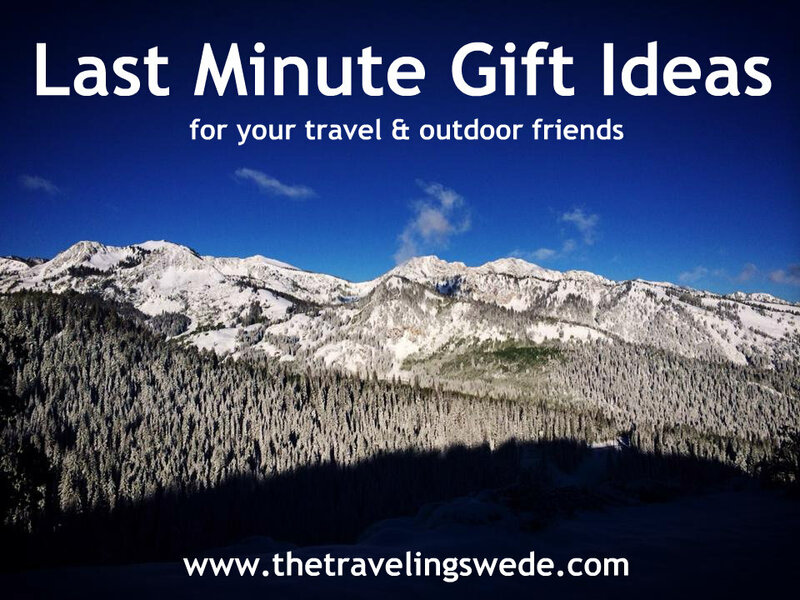 Easy to use and very practical for travel, hiking and more. I can’t wait to have a dog again so I can pick up a lot of awesome things from Ruff Wear. Their stuff is not only practical but durable and sassy! Plus their dog beds are incredible. 4. Give your friend some solar power on the go! GoalZero is my favorite brand among solar powered gadgets. Their products are going places like Mount Everest and the North Pole on expeditions for a reason. Their Switch 8 Recharger is a perfect gift for anyone on the go that need to charge their smartphone or alike. For less than $30.00 you can’t go wrong! 5. Anything from Under Armour is a perfect gift. Right now I love their ColdGear line. So much to choose from! I’m eyeing the Cozy Crew shirt. Functional but not that super tight fitting one. 5. Okay, I had to add a bonus number 5. Give them Rolf Potts book Vagabonding: An Uncommon Guide to the Art of Long-Term World Travel . It’s small enough to carry with you but the content is so valuable this has become the number one recommended book for travelers of all levels. You could also give them some awesome photo greeting cards and prints from my travels that I sell on Etsy under PhotosByCamilla. If you use coupon code Christmas2014 you save 25% on orders over $20.00. And if all else fails you can always give your friend a gift card! Hopefully this gives you some great ideas. Are you ready for the holiday season? Note: Links in here other than to my Etsy store are affiliate links. If you purchase through those links I receive a small commission at NO cost to you. It’s a great way for you to support this blog without it costing you a dime. I only recommend products and companies I personally use or believe in.